LYON, France, February 20, 2013 (ENS) – Interpol’s first international operation against illegal logging and forest crimes has resulted in nearly 200 arrests and the seizure of millions of dollars’ worth of timber and some 150 vehicles across Latin America. During the period from September 17 to November 17, 2012, law enforcement agencies in 12 countries in Central and South America worked together under the auspices of Interpol’s Environmental Crime Programme. Officials in: Bolivia, Brazil, Chile, Colombia, Costa Rica, Dominican Republic, Ecuador, Guatemala, Honduras, Paraguay, Peru, and Venezuela carried out inspections and investigations on vehicles, retail premises, and individuals, as well as surveillance and monitoring at ports and transport centers. Law enforcement officials reported a total of 194 arrests, with 118 individuals currently under investigation, and several cases of deportation. Seizures of wood and other forest products during the operation are estimated at more than 50,000 cubic meters of seized wood, enough to fill 2,000 trucks, with a total value of roughly US$8 million. But that is a small fraction of the global illegal timber trade, which David Higgins, manager of the Environmental Crime Programme at Interpol, estimates to be worth between US$30 billion and 100 billion annually. “This is a major development in the fight against illegal logging, which is a much bigger global problem than most of us realize,” said Billy Kyte, forest campaigner at the Global Witness office in London, UK. Much of the work Global Witness has done over the past two decades has been to expose how deals struck behind closed doors allow powerful elites to cash in on deforestation without regard for the human or environmental cost, while the local communities see none of the supposed benefits from logging. “For too long, governments and international enforcement bodies have turned a blind eye to the illegality and corruption that lies behind much of what ends up on our shop floors and in our living rooms,” said Kyte. “Interpol’s firm action alongside the governments concerned is a big step in the right direction and must be followed up with swift enforcement and prosecutions,” he said. As of March 3, the European Union’s new Timber Regulations will make it illegal for companies to import illegally harvested timber. 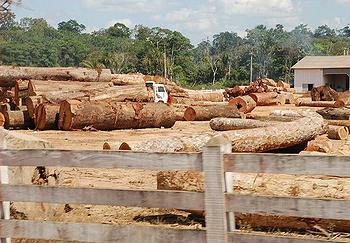 Companies will also be committing an offense if they fail to carry out checks, known as due diligence, on their supply chains, to ensure they know where their timber comes from and how it was obtained. One of the key aims of the Interpol operation is the development of practical cooperation and communication among national environmental law enforcement agencies, forest authorities, police, customs, and specialized units as well as with Interpol, known formally as the International Criminal Police Organization. 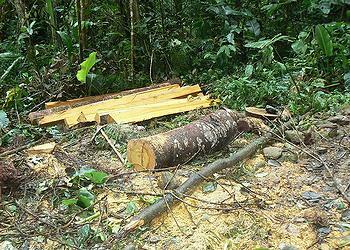 The intelligence gathered during this first phase of the operation will be used as a foundation for more “incisive actions against illegal logging” to be taken by Interpol, in cooperation with its member countries, said Davyth Stewart, Interpol criminal intelligence officer and team leader of Project Leaf. The trans-national nature of illegal logging raises difficulties for law enforcement and regulators, who are often limited in their ability to work outside their own domestic jurisdiction. Project Leaf assists law enforcement agencies from different countries in coordinating a global law enforcement response. “Interpol will continue to support countries to establish long term sustainable improvements in law enforcement responses to illegal and unsustainable deforestation,” said Stewart. Project Leaf is an initiative led by Interpol with the United Nations Environment Programme and with the financial support of the Norwegian Agency for Development Cooperation.